Browse: Home /	Community Building, Events, LIVABLE STREETS, Public Places, Sustainable Flatbush News / Park(ing) Day is TOMORROW! Join us for Park(ing) Day 2010! On Friday, September 17th, Sustainable Flatbush will once again create Cortelyou Road Park, a temporary green space for all to enjoy. This will be our fourth year participating in Park(ing) Day, an international event designed to inspire dialogue about public space and how we choose to use it. Our park(ing) spot is located in front of the Cortelyou branch of the Brooklyn Public Library. This library has a barren, underutilized plaza entrance, which we believe could potentially be a lively and popular public space. On Park(ing) Day we will gather impressions from passersby on how they’d like to see this public space used. In addition to Cortelyou Road Park’s usual people-friendly features (real grass, plants, seating, games, art supplies, and free snacks courtesy of Flatbush Food Coop) this year we have a great lineup of activities and performances! The day begins with Ronny Wasserstrom of Playdate Puppets, who was a BIG hit last year with his Juggling Egg and ScareKid marionettes. Stephanie Huffaker from Garbage of Eden Design will also join us again, with her fantastic jewelry made from recycled plastic bags. She’ll teach a workshop at 3:30 pm on How to Make an Eco Super Hero costume from recycled newspaper! To finish the day right Richie Barshay and Friends will treat us to live music, as a preview to the upcoming music series, Ditmas Acoustic @ The Sanctuary. Fast, Easy, and Fun! Puppets on the Run! You too can be an Eco Super Hero! Come hang out at Cortelyou Road Park with us! 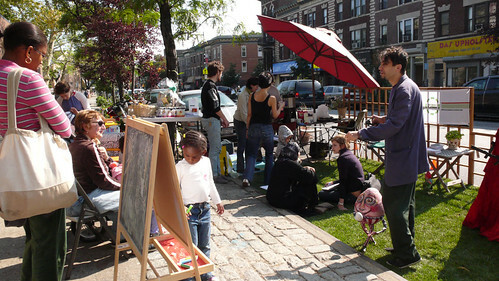 Check out our photos from previous Park(ing) Days on Flickr! Park day was great at least it was here in New Mexico. Lots and lots of fun plus somethings definitely raised some awareness.